Since 2003, nonsensical posts about noncritical issues in nonenglish. Red blogule or white blogule? It depends on the mood. Stephane MOT. Egalement: blogules en V.F. - NEW: join blogules on Facebook! 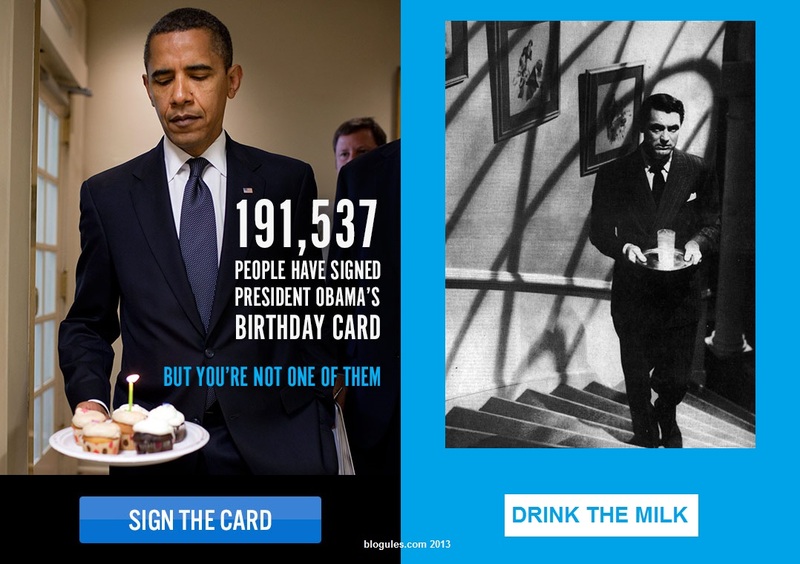 "191,537 people have signed President Obama's birthday letter. But you're not ONE OF THEM. Well. I'm still ONE OF THEM, them people who subscribe to Barack Obama newsletters. So the NSA didn't have to scan my profile to find out I didn't sign the darn card: I opted in 6 years ago. And yes, I still receive Karl Rove memos - you need a good laugh now and then. Ah! Ah! Guantanamo, can't get tired of that old Bush-Cheney joke! Actually, Obama's America invented something even better than Guantanamo in Cuba: One-man-ammo in Russia! You're afraid to face unfair justice in the US? Uncle Vlad will be happy to provide tailored hospitality in his model democracy. No, Eric Holder hasn't choked on a pretzel yet. Frankly, I think Saving Private Snowden is less important than Saving Public Manning. I'm not talking about poor whistleblower Bradley Manning, but about national intelligence services. Outsourcing intel at the core of NSA is already disturbing. To a Carlyle Group affiliate. As if Israel were outsourcing its strategy to the Boston Consulting Group. Sorry, wrong example. Outsourcing intel in Patriot Act times, when Big Data meets Small Government. Outsourcing intel means that the Big Brother who's watching you is not the NSA but Booz Allen Hamilton. And don't think these contractors are very careful when they handle or man this most sensitive mission. Booz Allen CEO Ralph W. Shrader said "Mr. Snowden was on our payroll for a short period of time, but he was not a Booz Allen person and he did not share our values". In other words: "Oh, you know, that mission you hired us for, spying for America? You can trust us: we gave the job to a most untrustworthy person. Anyway, we can't afford to keep the best ones, they sell their services to foreign companies and nations. Handling confidential NSA stuff, that's pretty good on a resume when you're looking for a job in Russia, in Pakistan, or at Facebook. Non Disclosure Agreements? We do those, but only to make sure the public doesn't know how much your Government is paying us. By the way, can we renegociate this contract of ours? We believe you need new servers and software to catch up with the competition. To build their own systems, they hired people who were trained on your obsolete material and knew all your weaknesses." McLean, Va. 795,582,003,441,637,794 data burgers served across the world. Outsourcing intel: - #ParriotAct + #BigData + small government = #BoozAllen is watching you - Saving private #Snowden or public #Manning? HOME - EN FRANCAIS - ABOUT - CARTOONS - VIDEOS - LISTS - Universal Declaration of Independence - add to favorites! - Visit my other sites : my personal portal, blogules (French Version), blogules archives (English , French), mot-bile blog (click & mortal), Seoul Village, footlog blog, Little Shop of Errors, Citizen Came (visitors stats). NEW: join blogules on Facebook! Free ebooks in English! Download your free copies of my 'Guisin-dong' and 'Year Of The Dog'. Party Unity My Ayatollah ? Justice in America, Democracy in Israel ? A Christmas Gift for Fundamentalists ? "Change is coming" and Mac "will fight", but for whom and for what ?